In her fifty year career, Ingrid Bergman earned three Oscars and cemented her place in Hollywood history by starring in enduring classics like Casablanca, Gaslight and Notorious. Her screen image of wholesome virtue was shattered in the post-War years when she fell in love with film director Roberto Rossellini and bore his child whilst still married to another man. The sense of outrage and betrayal in America is hard to imagine now but at the time she was condemned on the floor of the U.S. Senate. 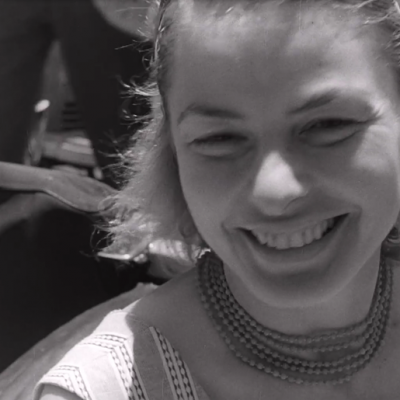 Journalist Stig Bjorkman’s intimate, lovingly compiled documentary offers a rare close-up on the woman rather than the screen idol. Bjorkman has been given access to extensive home movies (many shot by Bergman), family photos, personal correspondence and Bergman’s diaries which are read with feeling by fellow Swede and fellow Oscar-winner Alicia Vikander. Bjorkman does tell the story of the ambitious young girl who became the toast of Hollywood and there are interesting memories and insights from Sigourney Weaver, who had one of her earliest stage roles opposite Bergman, and from Liv Ullmann who co-starred with her in Autumn Sonata. It soon becomes apparent that this is not the film to provide anecdotes or behind the scenes tales from Bergman’s films with Bogart or her good friend Cary Grant. What matters more is the sense of Bergman’s restless spirit and the way childhood tragedy cast a dark shadow over her life. Bergman lost both her parents before she was a teenager and seemed to embrace a sense of impermanence. Throughout her life, she constantly pulled up her roots and started over in Hollywood, then Italy, Paris and eventually London. Husbands, lovers (including photographer Robert Capa) and children seemed to take second place to her commitment to acting and determination to live by her own rules. Her children, including Pia Lindstrom and Isabella Rossellini, talk with warm affection about a woman who felt more like a friend than a mother. Bergman was a loving, irrepressible figure in their lives but frequently absent as she left them for another distant location or a lengthy stage production. Their only criticism of her is that they would like to have seen more of her. Bjorkman’s film is full of admiration but also offers a clear-eyed assessment of who Bergman was and the sacrifices she made. The result is a charming portrait, given added poignancy by a lovely score from Michael Nyman.